In their debut CD, the award-winning Eos Sextet performs their personal arrangements of music by Pyotr Tchaikovsky and Samuel Barber, in addition to new works composed for Eos by Gregory Wanamaker, Carl Schimmel, and Ethan Cypress. The Eos Sextet is a dynamic chamber ensemble that formed with the intent of shifting the paradigm in saxophone chamber music. 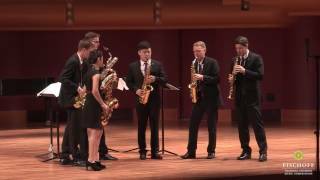 In a medium heavily dominated by the saxophone quartet tradition, the Eos Sextet has worked to create a new set of repertoire specifically for six saxophones. By commissioning diverse works from composers such as Gregory Wanamaker, Carl Schimmel, and Ethan Cypress, in addition to creating original arrangements of classical masterworks, Eos continues to build upon the rich tradition of saxophone chamber music in an exciting new way. 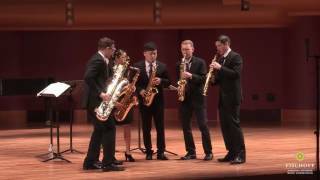 The body of work they have contributed to this repertoire has helped in standardizing the instrumentation of the saxophone sextet: one soprano, two altos, two tenors, and one baritone. Their debut album, EOS, was released in March 2018 through Soundset Recordings and features world premiere recordings of new works written for and arranged by the Eos Sextet. Their performance of Gregory Wanamaker’s “Counterpunch” is featured on his 2018 album Light and Shadows, Waves and Time, under the Navona Records label. 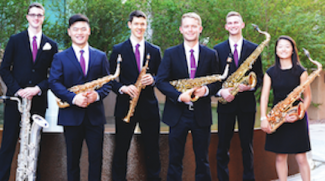 The members of the Eos Sextet formed in 2016 as students of Dr. Christopher Creviston at the Arizona State University School of Music. "Counterpunch is a loud concert opener or closer. It is an answer to my 2004 piece for saxophone quartet, speed metal organum blues." I. The beginning of the rainy season (“plum rain”) in Tokyo, and the full moon in June (“strawberry moon”). II. The annual Festival at Torigoe Shrine the warrior Yamato Takeru is enshrined within the massive mikoshi which is borne by his worshipers.